When Adidas announced that James Harden was joining its basketball roster over a year ago, it was all but certain that the Houston Rocket was going to get his own signature line. Signing with Adidas for a reported $200 million long-term deal, Harden was immediately looked at as the new face of the Three Stripes in the NBA. The bold move was both exciting and daunting for Adidas designers. In his seven years in the NBA and six years with Nike, Harden has never had a signature sneaker. The Harden project was in danger of being killed by the internet before it even started after images of an early blacked-out product sample leaked, causing social media users to pan the sneaker. Foresta said the designers took the jabs very personally. The aesthetic of the debut signature sneaker, the Harden Vol. 1, wasn't the only thing that was important in the creation process. Performance was also built to the standards of the eponymous player. Here, Adidas’ VP of global design for basketball breaks down how the brand kicked off its signature line for James Harden. James Harden was the catalyst for the new way Adidas Basketball is working with signature athletes. 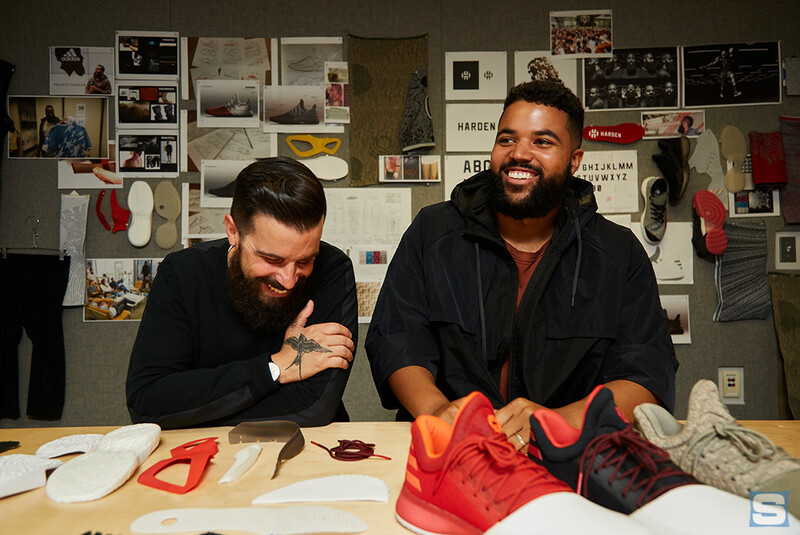 After spending time under the Nike umbrella, but being far removed from the sneaker design process, Harden was anxious to give his take on product design. Adidas designers were very open to listening and said their access to him set a new precedent for how the brand designs signature product. Foresta added that he would speak with Harden on a weekly basis from that point on. In fact, Harden gave designers more access than any other signature athlete. The Harden Vol. 1 was built around the toebox. Adidas’ research lab found that Harden’s style of play was extremely tough on his toes. Designers took this into account and built the shoe with the toebox in mind first. “Basketball players' toes get destroyed because the foot slides forward when they slam on the brakes, so we built the shoe so the foot sits further back so he can change direction quickly,” Foresta said, adding that the lead colorway and several other key colorways also have full-grain leather on the outside of the toebox for added protection. James Harden specifically requested a subtle logo. The Harden Vol. 1 features full-length Boost cushioning. The traction pattern on the outside of the shoe was designed through 3D printing. No, the Harden Vol. 1 is not a Futurecraft shoe. But Aramis, a technology used by Adidas and NASA to measure out pressure points on the foot, was used on Harden’s first signature sneaker to map out where he needed the most traction. The pattern is built to the specifications of Harden’s foot. There's a tribute to his family etched into every pair. There is a set of numbers on the back of both the left and right shoe that is decoded to be his mother’s birthday and his grandmother's birthday. There's also more to them. "It’s done backwards, so it goes month, day, and then year. Then there are three zeros that represent the three stripes," Foresta said. "We always work in elements of three. There are a lot of small details, but we didn’t want to just kind of go down that road when you splatter them all over the shoe." Kanye West x James Harden? Yes, Kanye West has performance Yeezys on the way. But he had his hands off of working on this project. Foresta didn't confirm that West was even in the plans to work on the Harden line...yet. "All I can say is that Kanye's always pushed the brand, there's a lot of similarities there," he said. "But I think if there's a natural place for it to happen, it will. At this point we can’t really say whether we will or not." Page James Harden was the catalyst for the new way Adidas Basketball is working with signature athletes.